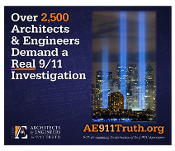 9/11 Truth Good for America vinyl banner in 2 sizes – for local July 4th and other patriotic events. 9/11 Truth: Good for America Sidewalk Banner – have a real patriotic message be the center of attention this July 4th & September 11th! With the iconic 3rd beam for WTC 7 & the support of 2,500+ architects and engineers.